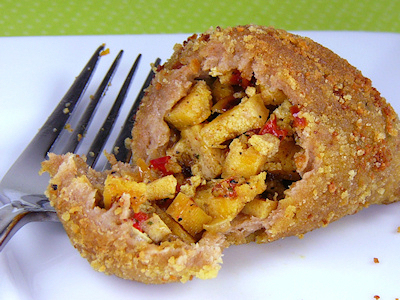 Wing It Vegan: E.A.T World: Coxinhas and Brigadeiros in Brazil! E.A.T World: Coxinhas and Brigadeiros in Brazil! It's very nice here! The beaches are beautiful, though I wish everyone would stop staring at me as if I were some sort of alien. It's like they have never seen a person wearing onesie culottes and a bathing cap before. Anyway, we just cannot go to Brazil and not listen to some cool Bossa Nova. If you would like to play some ambiance music and sway from side to side on your chair while you listen to The Girl from Ipanema, just hit play on the little gadget below. Sway. Sigh. Repeat. On to the food! After much research I decided to make some Coxinhas, which are Mock Chicken Drumsticks. Not mock chicken, but mock drumsticks. From Wikipedia: Coxinhas are "made from shredded chicken and spices (occasionally including Catupiry-style cheese), enclosed in wheat flour—variants made from potato or manioc are also common--batter, and deep fried. It is shaped to roughly resemble a chicken drumstick, and sometimes a toothpick is inserted where the bone would be." Wrapped in dough? Breaded? Fried? I'm in! Chicken? Mmmnothanks. I thought about making a mushroom filling, but after lots of self-debating I decided to go with a tofu filling. Mock, mock chicken drumsticks! The recipes that I used for inspiration are this one and this one. The step by step photos were very helpful, and even though both recipes are for traditional chicken coxinhas, they were very easy to adapt and use little tofu cubes instead. The verdict? Meh. Coxinhas definitely have potential, but the dough was not enjoyable for me. Next time I will just make a pot pie dough/crust instead. The filling was very tasty, and you can't go wrong with a breadcrumb coating, but the dough was too... doughy. The coxinhas were a mild disappointment, but the chocolates sure were heavenly! Who wants some Brigadeiros? I cannot begin to tell you how deliciously addictive these are. They are soft and creamy and smooth and sweet and chocolaty and... *sigh*. 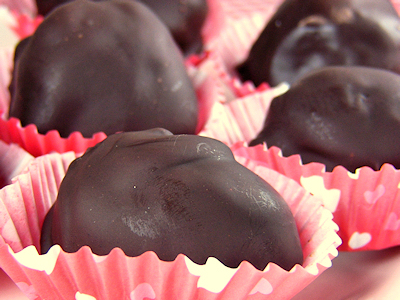 They are little chocolate balls made with sweetened condensed milk, cocoa powder, and butter. This was a big challenge because I had to make my own dairy-free condensed milk. Recipe here. I tried to make these a total of four times! Though I only made half a recipe each time. Hmmm. That still sounds pretty crazy. The first time that I tried to make them they were a complete failure! The condensed milk didn't cook long enough, which caused the chocolate mixture to remain gooey and soft even after a whole day in the fridge. Not to worry, no food goes to waste here and after a wave of my magic wand they became a tiny batch of brownies. The fourth time? I followed the recipe very faithfully (using non-dairy ingredients), I used cocoa powder this time and they were a complete success. Fourth time is a charm! The only thing that I didn't do was roll the brigadeiros in chocolate sprinkles, because I am not a fan of sprinkles. Whoa. Millions of children all over the world just *gasped* and they have no idea why. I rolled them in coconut flakes and drizzled some melted chocolate chips all over them. My stay in Brazil was very productive and I leave this country as an expert brigadeiro maker. Even though the coxinhas weren't the most delicious thing I've ever eaten, they inspired me to play with the concept and try a different dough and different fillings. OK, I have to get out of this beach before people start pointing and laughing. See you next time from my next destination! Here's a hint: Ricky Ricardo! your persistence paid off! 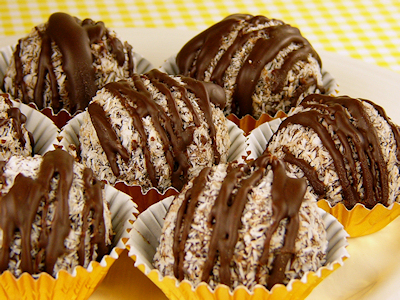 The brigadeiros look spectacular. 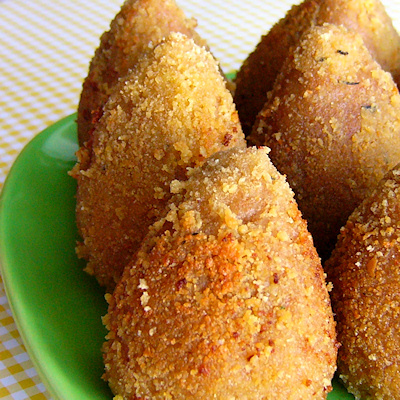 I think I might just become obsessed with the idea of the coxinhas--brazilian dumplings oh my! The idea has so much potential--maybe we should start a make-coxinhas-perfect club. And the chocolates? Utterly divine! Your creativity and culinary genius are inspiring! Even if the dough wasn't great, that is some amazing breading action! And the chocolates look insanely good! As coxinhas e os brigadeiros são perfeitos!! YUM!! Lisa - Thank you! I wasn't about to be defeated by some delicious chocolate! Mo - Thank you! The breading was really good (really, isn't everything that is breaded good?). I really must try making them again with a different dough. Maybe Brazil should be revisited at some point? Memória - Muito obrigada! OK, that's all the Portuguese I know! :-D How exciting to receive a comment in Portuguese for my Brazilian post! I am so tickled! shame the dumplingy things weren't great because they look delicious!! and those chocolates look so effing good. Shame the coxinhas were not not as great as the choccies, but you can't win them all! I'm very much looking forwards to the next thrilling installment of your E.A.T World Tour! (Hello Cuban noms??). You had me at ooey gooey chocolate. Yum! Both of these dishes sound exciting - the coxinhas look awesome, and the breading looks great, even though you say it was a bit of a letdown. The tofu filling sounds tasty too. Thanks for introducing us to coxinhas! Deep-fried goodness really is a universal thing, isn't it? Joany - Thank you! The chocolates really were irresistible! Mr. Kook is not a big fan of chocolate, so he ate one half of one and I ate the rest. I'm not sorry I did it! Mwahahahaha! Both the recipes look amazing, but I think I'd faint for the brigadeiros. If the last batch worked perfectly, just wondering why the 3rd was your fave? What an awesome post, River! I can't believe you tried the recipe four times, and that's exactly how I would have done it. I'm sorry the drumsticks didn't work out...at least they are pretty! i've never heard of coxinhas before, River! i love this - i always learn something new from your posts! yay! i'm sorry the coxinhas were a bit doughy, and that you ended up making the brigadeiros four times to get them to be the absolute yummiest, but you're too awesome for sticking with it and getting them to be the best! they look heavenly! mmmmmmmmm! 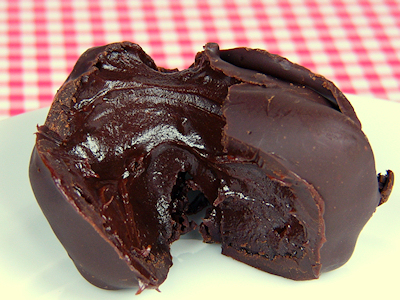 I'd love to get my hands on some brigadeiros. Never heard of em before, but now they have my full attention. Must try to recreate those georgeous things! All chocolate is good, no matter.....except for sprinkles, tasteless little things of wax! Jessy - I had never heard of coxinhas before, or brigadeiros either. How could have lived the first 30 years of my life without knowing about the divineness of the brigadeiros?! Jess - Good luck! The trick is to get the stupid condensed milk just right if you're making them from scratch. But if you can buy a can of soy condensed milk then it should be a breeze! The sight of those chocolate things just made me drool. Better luck next time with the coxinhas, I'm sure you'll get it right. I never even heard of those before, but they sound good (your version does anyway). I just stumbled upon your blog, and I LOVE it! I also blog about food and crafts. I hope you don't mind, but I'm totes adding you to my blogroll! incredible! everything looks so scrumptious. Now i had never heard of Brigadeiros before in my whole life both those look heavenly. I love the coconut on top with the chocolate drizzle. Your right those would be perfect for valentines day. You are so persistent, and it certainly paid off. Those are some crazy delicious looking chocolates. So cool you got to be in Brazil! Dina - You can say that again! Michal - Thank you! Brigadeiros were news to me too, but I sure am glad I found them! 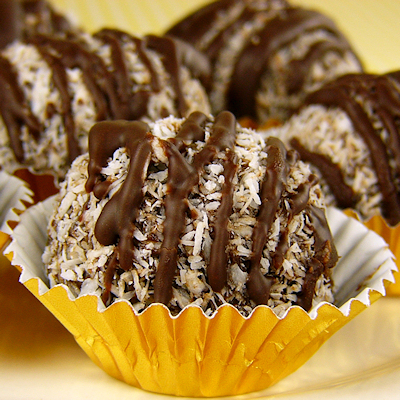 Coconut + chocolate = heaven! Those chocolates look amazing! And I am so impressed with your persistence, four times? That's inspiring! Hi, I just discovered your blog and that post really got my attention because I'm from Brazil and people from around the world don't always get to know our traditional food. Actually I was impressed by your persistence with the coxinhas, and I have to say, for a first time, it looks pretty good. Me and my boyfriend tried some recipes and they don't always work out great, but we enjoy it anyway. 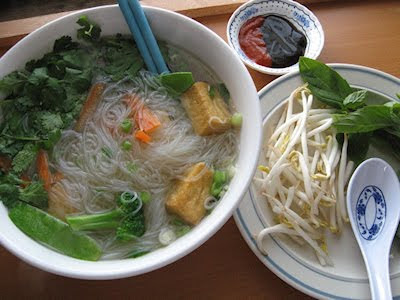 You should boil the soy milk or water, when it boils add the vegetable stock, the salt and the pepper and than slowly add the flour. The important thing is to keep stiring during the whole "flour process" so that the dough doesn't get any clumps (that's the hard part for us). That's pretty much it. I hope I could help (sorry for any english mistakes I might have made). Good luck with your future coxinhas.